Isotoma axillaris is widespread from Victoria through New South Wales and Southern Queensland. It grows naturally in damp crevices or shallow soil in rocky areas. 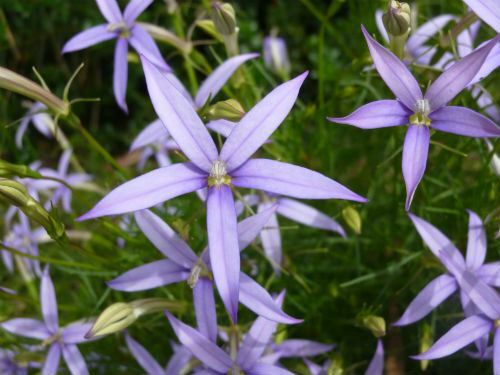 I always have a few Isotoma axillaris growing in my gardens as they are a great small plant, growing to about 40cms high and about that wide, with a prolific display of blue star flowers that are about 3cms in diameter. The flowering period is quite long, starting in October and flower well into late summer if not allowed to dry out for too long. 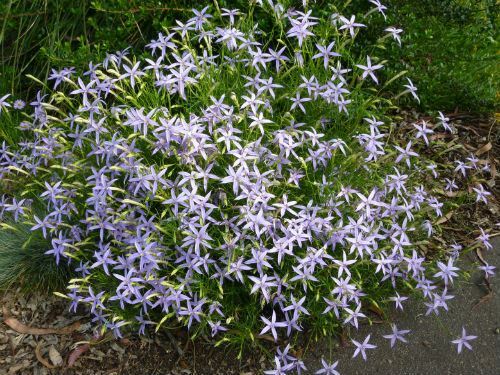 I use them to define borders and they look great growing adjacent the blue flowering Brachyscome multifidia plants. They prefer to grow in full sun in lighter soils but I have found them quite adaptable in my northern Sydney’s suburbs garden. Isotoma axillaris grow much better if not allowed to dry out for too long and after a wet 2011 winter, they are growing and flowering the best for years in my garden. Maintenance: After flowering the foliage will die off and I then cut the plant back hard, to encourage fresh new growth. Alternatively, if conditions are good you will have just enough seedlings that can be dug up and replanted where you require them. Every two or three years Isotoma axillaris are eaten by little green caterpillars, 2 or 3cms long, the exact same colour as the foliage, they can be removed easily by hand (once you know what to look for). A word of warning -- Be careful when cuttings stems as they exude white sap that produces a severe stinging sensation if rubbed on eyes and may cause irritation to sensitive skin. However, this should not stop you growing these plants as the flowering display is worth the care.